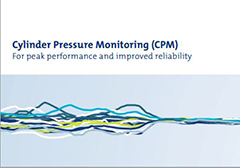 first class products, power systems and service solutions. Rolls-Royce medium-speed liquid fuel and gas engines and generator sets are characterized by high availability and low operating costs. We support your business with reliable, engine based power generation solutions from 1,400 to 11,830 kWe per engine, and complete power systems that can deliver an output of beyond 200 MWe. The tradition of Rolls-Royce medium-speed engines dates back to 1855 when the original company Bergen Mekaniske Verksted (BMV) was founded. In 1946 we started to build diesel engines and since then we have sold more than 7,000 engines of which 4,000 are still in operation. 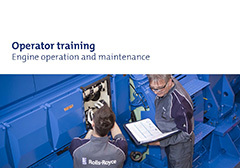 Nowadays, the Rolls-Royce Power Systems subsidiary is part of Rolls-Royce plc. 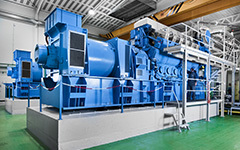 Our medium-speed gas and liquid fuel engines and generator sets are supplied for a broad range of power generation applications and are operated worldwide. We also offer engines for Marine applications, and these are marketed and sold exclusively through Kongsberg Maritime. For high-speed engines and generator sets from Rolls-Royce Power Systems, please visit the MTU Onsite Energy website. Flexible and modular engine based power plants installed in our own designed self-contained engine packages, can be supplied with all the components and auxiliaries needed to construct a fully working power station with the possibility of extension whenever additional modules are needed. It is a cost efficient solution to providing electrical power. 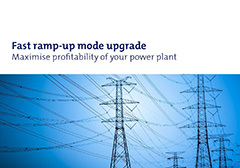 The power generation solutions suit for base load, combined cycle, grid support, stand-by and peak shaving. 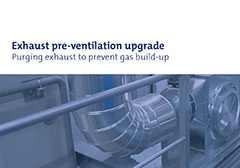 Many engine installations require heat recovery, whatever their applications. Our experience ranges from remote power supply to co-generation and tri-generation, with efficiency levels beyon 95% in climates ranging between the arctic freeze of Svalbard, and hot and humid Bangladesh. We support our customers delivering high efficiency power plants for district heating, industrial CHP, greenhouses and tri-generation. At hybrid power plants, percentage of produced electricity typically varies between renewable energies, generating sets and energy storage. 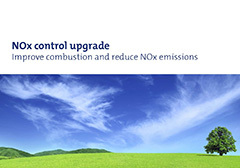 Our flexible and cost effective reciprocating engines are the perfect match to renewable energy. They are capable of fast and frequent starts and stops, and manage dynamic load response for grid balancing effortlessly. Each of the division's business segments reported good sales figures, some extremely good. Marine sales were 12% ahead, with sales of Industrial drive systems up a full 40%. Powergen revenue grew by 5%, making it the only segment with a lower rate of growth than in 2017, a year that saw unusually high increases. 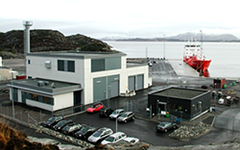 Subsidiary Bergen Engines in Norway has turned the corner and is now also a successful player in the stationary power generation market. 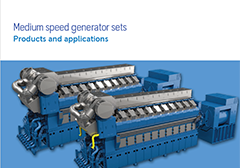 For the first time, it produced more engines for power generation applications than for ship propulsion. 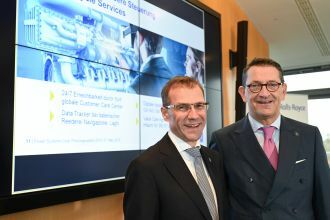 “With our RRPS 2018 transformational change program, we have fundamentally revamped the division's cost structure, for example by eliminating a good quarter of product variants at a stroke,” said Marcus A. Wassenberg, Chief Financial Officer and Chief Human Resources Officer at Rolls-Royce Power Systems AG. At the same time, the organization and structures have been moulded to current requirements and aligned steadily to the needs of customers. “This has not only produced favourable results in 2018, but has also created a robust, forward-looking corporate structure for the longer term, which we will be using to implement the PS 2030 strategy,” Wassenberg continued. 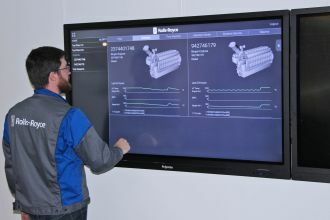 Rolls-Royce is developing several new digital solutions that will revolutionize the way its customers manage their power plants with medium speed Bergen engines. Rolls-Royce has signed a contract with C-Energy to extend their power plant installed capacity with further 23 MWe. 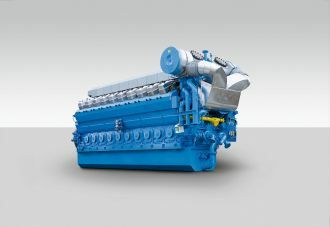 Rolls-Royce has today launched a V-line version of the new B33:45 liquid fuel and B36:45 gas engine series. 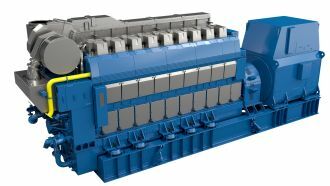 Rolls-Royce has today launched a V-line version of the new B33:45 liquid fuel and B36:45 gas engine series. This completes the new engine family, following the launch of the first variants three years ago. “This is an important milestone for us. The new V-Engine series is truly an outstanding product and we believe that the new platform confirms Rolls-Royce’s position as a global provider of some of the world’s most efficient power plants,” said Peter Headland, Head of Customer Business at Bergen Engines AS, which is part of Rolls-Royce Power Systems. The V-line will consist of 12, 16 and 20 cylinder, while the inline platform is available in 6, 8 and 9 cylinder. At 600 KW per cylinder the new engines offer a 20 per cent increase in power per cylinder compared to their predecessors. In addition, the engines set a new standard in power and efficiency with exceptionally low fuel consumption and emissions of NOx, CO2, SOx and particulates. 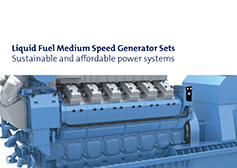 "Our medium speed engine range is renowned for its robust design and high reliability. The new engine builds on and improves our existing capabilities, with a completely new modular architecture. This makes for an engine family that is truly engineered for the future, with numerous configurations, multiple fuel options, and low life cycle costs," said Leif-Arne Skarbø, Chief Technology officer at Bergen Engines AS. With a modular design, the B33:45 liquid fuel and B36:45 gas engines will share the same core components. This allows for fuel conversion between gas and liquid fuels with minimal downtime, and will create a very flexible platform for customers. This is especially beneficial in countries with transitioning fuel options. The new engine is applicable for different operational modes. This includes baseload, grid balancing, load following and peaking. Waste heat and CO2 can also be efficiently used for industrial processes, district heating, air conditioning, or to drive a combined cycle. The B36:45V20 will be the first variant available in the new V-series. 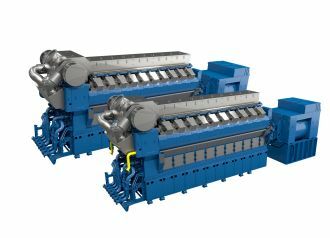 The very first two engines are planned to be installed as an extension to an existing Rolls-Royce 37 MWe combined heat and power plant in Czech Republic. With the extension, the power plant will, from the end of 2019, deliver 60 MWe electricity and heat for companies and homes in the nearby town. Rolls-Royce has signed contracts for five greenhouse projects in Belgium and Netherlands to be powered by the new B36:45 L6 and L9 gas engines. Rolls-Royce has signed contracts for five greenhouse projects in Belgium and Netherlands to be powered by the new B36:45 L6 and L9 gas engines. These engines set a new standard in power and efficiency with exceptionally low fuel consumption and emissions of NOx, CO2, SOx and particulates. It offers a 20 per cent increase in power per cylinder compared to existing engines in the Rolls-Royce medium-speed range. The engines are produced at Bergen Engines AS, which is part of Rolls-Royce Power Systems. The contracts comprise a total of seven engines which will provide heat and power to both new and existing greenhouses. Customers include MTS de Jong Francke in Holland, and VW Tuinderijen, Tuinbouwbedrijf Marc Pittoors (T.B.M.P), Tomato Masters and Tomw@tt in Belgium. The electrical power produced will primarily be used for greenhouse grow lights or exported to the regional grids. Heat extracted from the exhaust gas and the engine’s cooling water system will provide heating, and cleaned CO2 from the engines will be injected into the greenhouses to boost plant growth. In total, the technology achieves efficiency levels of more than 96 per cent. 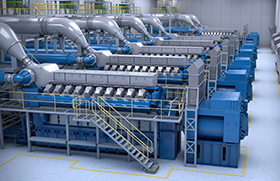 Rolls-Royce has signed a contract with EPC contractor Energyco for the supply of four gensets to a cogeneration plant in Kosice, Slovakia. BERGEN, NORWAY – Rolls-Royce has signed a contract with EPC contractor Energyco for the supply of four gensets to a cogeneration plant in Kosice, Slovakia. 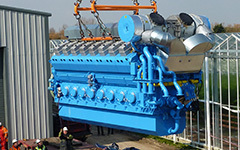 Based on the medium speed gas engine B35:40V20AG2, the plant will generate a total of 37 MWe heat and power for the district heating company Teplaren Kosice a.s. The contract will also include a service agreement for 5 years. The engines are produced at Bergen Engines AS, which is part of Rolls-Royce Power Systems. “We have been working closely with Rolls-Royce for this project for more than a year. One of the critical parameters required by TEKO was 3 minutes start to full load to comply with Slovakian grid support service. 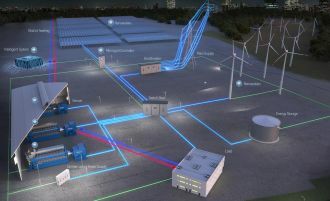 This was new for us and we appreciate that Bergen Engines could commit to these requirements,” said Lubomir Fejko, Energyco Project & Site Manager. “Rolls-Royce Power Systems delivered a strong performance in the financial year just ended and has held its ground well against the competition,” CEO Andreas Schell said during a press conference on the financial results for the year 2017 on 7 March in Friedrichshafen. Underlying revenue was up 3 per cent to 2.92 billion pounds sterling. Return on sales also rose significantly to 11.3 per cent (+ 4.1 percentage points). As a result, with a profit of 330 million pounds, Rolls-Royce Power Systems reports a 61 per cent profit increase compared with the previous year. The order book standing at 2.19 billion pounds sterling is very healthy and shows a 4 per cent improvement on 2016. With this result for 2017, the Power Systems division with its core brand MTU accounts for 19 per cent of the total revenue generated by the Rolls-Royce Group and is thus once again the second strongest revenue driver in the Group, which in 2017 was organised into five businesses. “The year 2017 has put us back on track for success,” said Marcus A. Wassenberg, Chief Financial Officer at Rolls-Royce Power Systems. “We benefited on the one hand from the growing market and the good performance of the global economy. 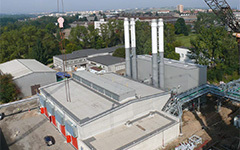 What clearly contributed to the excellent result was the fact that, with our RRPS 2018 transformation programme, as a result of optimising costs, service and sales, we were able to significantly improve our profit situation.” Detailed product analysis resulted in a 25 per cent reduction in product variants, which, together with improvements in material costs, quality control, stocks and use of facilities, ultimately led to significant savings. Our service initiative bore fruit in 2017 – total service revenue was up 6 per cent, due primarily to our business in MTU Reman engines and services provided for the invigorated oil and gas business in the USA. 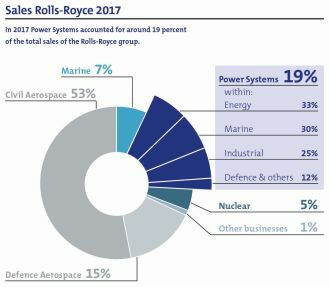 One third of the total revenue of Rolls-Royce Power Systems in 2017 was again generated by the energy sector, which continues to be a viable future business field. 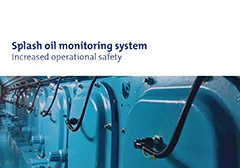 Additional growth was achieved primarily in diesel systems for emergency gensets, e.g. for data centres in China and the USA. Business in medium-speed engines manufactured by our subsidiary Bergen Engines A.S. stabilised in 2017, due principally to orders for the delivery of power generation systems together with the associated service. Sales of engines for the construction, agricultural and industrial sectors increased significantly in 2017. The further development of engines in the lower output range in anticipation of the EU’s new Stage V emission standards scheduled to come into force in 2019 resulted in large-volume orders. One of the major customers is the agricultural machinery manufacturer Claas. 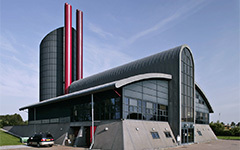 Rolls-Royce Power Systems in 2017 reported successes as a result of its Green and High-Tech programme, with which the company is making targeted investments in environmentally-friendly solutions for the future designed to reduce pollutant emissions and the consumption of both energy and raw materials. The first MTU Series 4000 mobile gas engines were delivered to the Dutch shipping company Rederij Doeksen. The engines are so clean that they are allowed to operate on the Wadden Sea nature reserve. In the San Francisco Bay area, the first MTU diesel engines meeting the stringent EPA Tier 4 requirements will enter service before the end of 2018. WETA, the San Francisco Bay Area Emergency Transportation Authority, is putting its trust in the new integrated MTU propulsion system consisting of Series 4000 diesel engines and an SCR exhaust gas aftertreatment system for its new high-speed ferries. “In the 2017 financial year, we made considerable progress on our way from being purely an engine supplier to becoming a solutions provider that supplies its customers with drive and propulsion systems and their permanent availability,” Andreas Schell explained. Since last year, Rolls-Royce Power Systems has provided its customers with support from experts in its new Customer Care Centres in three different time zones. New digital tools, such as MTU’s GoAct app or MTU’s GoManage internet platform, are designed to significantly improve the quality of service provided. They are being developed by an in-house digital unit set up in 2017. 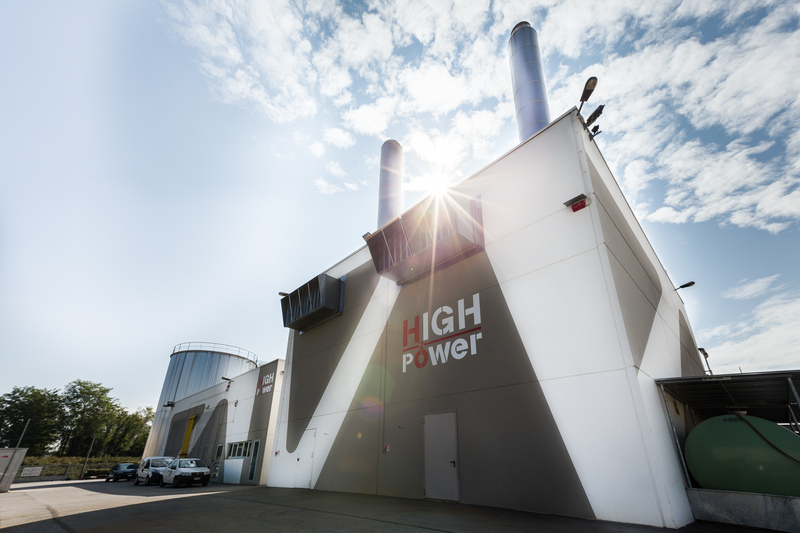 Rolls-Royce has signed a contract with Tuinbouwbedrijf Marc Pittoors (T.B.M.P) BVBA, for the supply of a 7 MWe combined heat and power plant (CHP). 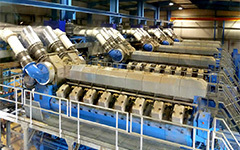 BERGEN, NORWAY – Rolls-Royce has signed a contract with Tuinbouwbedrijf Marc Pittoors (T.B.M.P) BVBA, for the supply of a 7 MWe combined heat and power plant (CHP). The plant will be powered by two gas-fired gensets based on the new medium-speed Bergen B36:45L6 engine and will provide heat and power to a new tomato greenhouse in Belgium. The contract also includes a service agreement for 10 years. The gensets are scheduled to go into operation early November 2018. Marc Pittoors, CEO of T.B.M.P said: “For our tomato producing company, three factors were crucial in taking this decision: electrical efficiency (best in the current market), expertise (Rolls-Royce developed a gas engine in the early 90s and was the pioneer in lean-burn technology) and optimum heat balance (5 hectares of greenhouse space are illuminated and 3.5 hectares are not).” Paul Hovius of PaCHov Consultancy conducted the sales and contract negotiations for this first CHP equipped with the new Bergen in-line engine. “The greenhouse market is very important for us, and it’s a pleasure to sign a contract with a highly professional customer for this new generation of gas engines,” said Jeff Elliott, managing director of Bergen Engines, a fully-owned subsidiary of Rolls-Royce Power Systems and supplier of medium-speed engines. Rolls-Royce Power Systems subsidiary Bergen Engines signed contracts for the delivery of two power stations to Bangladesh with a contract value of 133 million Euro. BERGEN, NORWAY – Rolls-Royce will be showcasing its medium-speed power solutions at stand 1435 of the Green Expo trade fair in Mexico from 5 to 8 September. 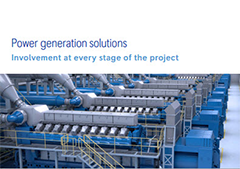 Its product portfolio covers a variety of power generation solutions for different applications, from generator sets delivering 3,700 to 9,400 kWe to fully engineered power plants capable of outputs from 5 to 200 MWe and beyond. 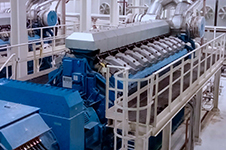 Having closed an EPC consortium agreement with engineering company Sampol Ingenieria y obras, Rolls-Royce’s first 18 MWe power plant based on medium-speed engines went into operation in June 2017 in Sonora, Mexico. 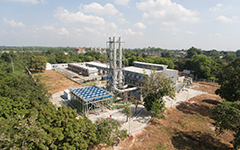 The plant has now clocked up almost 2000 operating hours without any complications, even at 45°C. 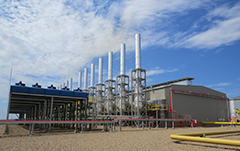 It is a cogeneration (CHP) plant owned by utility company Union Energetica del Noroeste (UEN), who sells the generated electricity onwards to various companies. 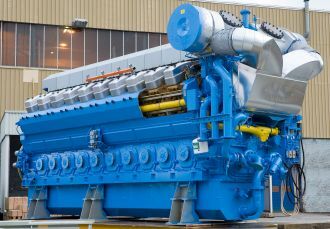 The plant is equipped with two Rolls-Royce Bergen B35:40V20 gas-fuelled generator sets covered by a 12-year service agreement. 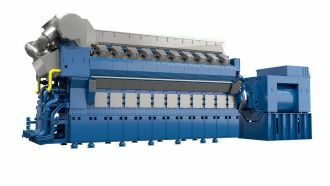 Another two CHP modules supplied by Rolls-Royce are scheduled for commissioning at the end of 2017/early 2018, and will be the first two power plants to have been supplied under Mexico's Energy Reform that came into force in 2016. 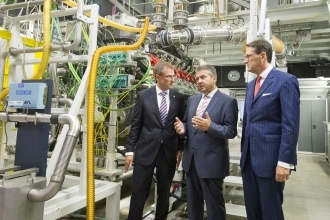 On a visit to Lake Constance, German Minister of Foreign Affairs Sigmar Gabriel visited Rolls-Royce Power Systems in Friedrichshafen on Monday 14 August, to hear about development and production of the very latest propulsion and drive systems for ships, trains and heavy land vehicles, and for power generation. FRIEDRICHSHAFEN – On a visit to Lake Constance, German Minister of Foreign Affairs Sigmar Gabriel visited Rolls-Royce Power Systems in Friedrichshafen on Monday 14 August, to hear about development and production of the very latest propulsion and drive systems for ships, trains and heavy land vehicles, and for power generation. “The Green and High-Tech programme at Rolls-Royce Power Systems opens up further prospects for German industry. The company has thus launched an initiative that I gladly support,” said Foreign Minister Sigmar Gabriel on his tour through the plant. CEO Andreas Schell and CFO Marcus A. Wassenberg took the minister on a tour of the plant to explain the company’s Green & High-Tech programme and talk about the key international growth markets for this technology. “At Rolls-Royce Power Systems, we launched our Green & High-Tech programme in 2016. It involves us investing very deliberately in environmentally-friendly solutions of the future which are aimed at fewer pollutant emissions and lower consumption of energy and raw materials. 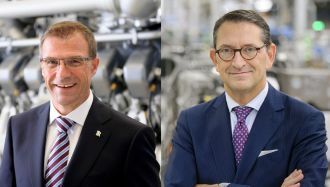 It is absolutely key to keeping the company competitive on the international stage,” said Andreas Schell, and showed Gabriel a specific example at the company’s natural gas engine test stand. 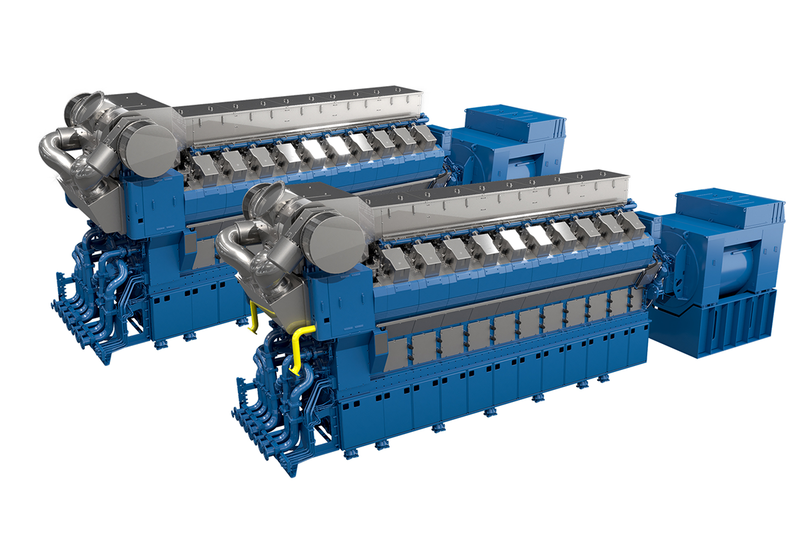 MTU is to ship the first certified production gas engines for marine applications in 2018. These MTU engines, which run on liquefied natural gas, have attracted major interest from across the world. The first pre-production engines are being delivered to the Strategic Marine shipyard in Vietnam at the end of the year for installation in catamarans being built for Dutch shipping company Doeksen. The vessels will be used to ply ferry routes in the Wadden Sea nature conservation area. Lake Constance, which is Europe’s largest reservoir of drinking water, is also set to get a new ferry powered by MTU natural gas engines in 2019. The highlights of the product line-up at Rolls-Royce Power Systems feature not just gas engines, but also diesels with newly-developed exhaust aftertreatment technology to meet strict international emissions requirements, and also diesel hybrids. Large ships, haul trucks and trains all require high power outputs, meaning internal combustion engines – such as diesel engines – remain indispensable. MTU’s highly refined diesel engines are currently being chosen for new ferries in the San Francisco Bay area. California is regarded as one of the areas with the most demanding environmental protection regulations worldwide. Rolls-Royce Power Systems makes 90% of its revenue abroad. “We’re concerned about growing levels of protectionism in some countries, trade barriers and sanctions,” CEO Andreas Schell explained to the Minister for Foreign Affairs. Sigmar Gabriel was also impressed by Rolls-Royce Power Systems’ offering to employees – flexible working hours, a Group-wide health management system, leisure facilities and counselling services, as well as a day-to-day culture which makes it easier to combine work and family life. 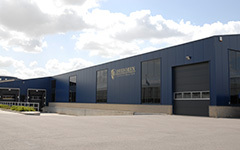 “In order to continue managing our company successfully as it moves into the future, and to adopt a leading role in the face of international competition, we want to provide a working environment which offers freedom – in terms of time and location – in the way people organize their work, and one which encourages creativity and personal responsibility,” explained CFO Marcus A. Wassenberg. 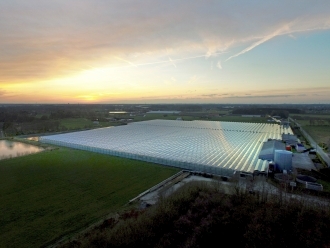 Since the beginning of the year, two Rolls-Royce combined heat and power plants have been supplying energy to a new tomato greenhouse operated by Maxburg BVBA in Meer in Belgium. FRIEDRICHSHAFEN – Since the beginning of the year, two Rolls-Royce combined heat and power plants have been supplying energy to a new tomato greenhouse operated by Maxburg BVBA in Meer in Belgium. 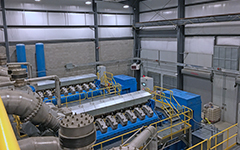 The two gas-powered gensets have reliably supplied over 20 Megawatt hours of heat and power to date. Maxburg is now the 30th greenhouse for which Rolls-Royce has delivered combined heat and power plants. Since 2005, no less than 52 combined heat and power plants manufactured by Rolls-Royce have generated a total electrical output of 270 MW in greenhouses in Holland, Belgium, Russia and the UK. The gensets are based on the medium-speed B35:40 V12 AG2 engines from Rolls-Royce, each of which is able to generate an electrical output of 5,650 kW and a thermal output of 6,545 kW. They achieve an efficiency level of more than 96 per cent. The electric power is used primarily for the greenhouse lamps and, if required, is fed into the public grid. 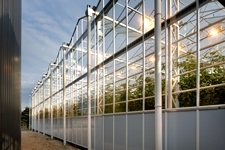 The greenhouse, which extends over an area of 10.2 hectares, is heated using the heat extracted from the exhaust gas and the engine’s cooling system. The cleaned exhaust gases from the engines are also injected into the greenhouses to increase the level of CO2 and boost plant growth. John Vermeiren expects to achieve an annual production of 7.5 million kilogrammes of tomatoes at the Maxburg greenhouse. 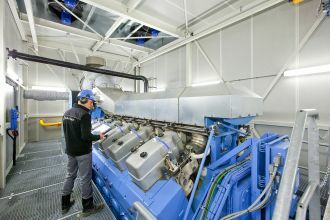 Rolls-Royce has delivered the complete CHP plants, consisting of the power generator sets, the exhaust gas systems, including the SCR systems and the heat exchangers. The electronic control systems are also included in the scope of supply. 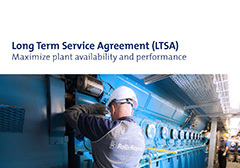 Operator John Vermeiren and Rolls-Royce have concluded a long-term service agreement for the combined heat and power plants covering approximately 4,500 hours of operation per year over the next 10 years. Rolls-Royce will be showcasing medium-speed and MTU Onsite Energy high-speed power generation products on Stand S2 D30 at the Middle East Electricity trade fair taking place in Dubai between 14 and 16 February 2017. FRIEDRICHSHAFEN/DUBAI – Rolls-Royce will be showcasing medium-speed and MTU Onsite Energy high-speed power generation products on Stand S2 D30 at the Middle East Electricity trade fair taking place in Dubai between 14 and 16 February 2017. The product range comprises a variety of power generation solutions delivering between 24 and 9,400 kWe and covering a wide range of applications and fuel types. 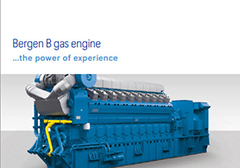 The brand MTU Onsite Energy is part of Rolls-Royce Power Systems. As of autumn 2017, MTU Onsite Energy will be offering a diesel genset with a 10% higher output based on the 20-cylinder Series 4000 engine. The higher output of 3,730 kVA for emergency power applications and 3,390 kVA for prime power is available at temperatures of 50 degrees Celsius. The genset has a very high power density and thus a space-saving design, since the engine’s dimensions are identical to those of the predecessor model with a higher output. Diesel generator sets up to 3,400 kVA and gas engine systems up to 2,500 kW will be presented under the MTU Onsite Energy brand. A 12V 4000 diesel genset will be on display and a model of a 18V 2000 diesel genset, equipped with common rail technology and deliving an output of up to 1,400 kVA. A model of a 16V 4000 container genset, will also be exhibited as gas and diesel versions. MTU Onsite Energy's decentralised gas and diesel engine systems are used in continuous operation scenarios, for peak generation and emergency power applications. They play mission-critical roles in environments such as airports, hospitals and data centres. 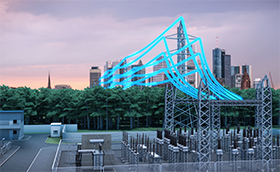 Whether standard products or custom-built, MTU Onsite Energy systems offer superb reliability and flexibility combined with low lifecycle costs. Rolls-Royce will be presenting a medium-speed gas engine model from its B35:40 series which incorporates engines with a range from 3.7 to 9.4 MW. The generator systems benefit from robust design and above average electrical efficiency of up to 48.5 per cent. Applications include base load power generation, grid balancing and peak load supply, combined heat and power and combined heating, cooling and power plants, emergency power and mechanical drive systems for the oil and gas industry. Have a tour of our power plant! Do you have questions or do you need advice regarding our products and services? Then feel free to give us a call or to send us an e-mail. We are looking forward to hearing from you and will come back to you as soon as possible. Copyright 2019 Rolls-Royce Power Systems AG. All rights reserved. The text, images and graphics and their arrangement are all subject to copyright and other intellectual property rights. These objects may not be copied for commercial use or distribution, nor may these objects be modified or reposted to other sites. 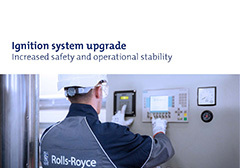 Rolls-Royce Power Systems AG has sought to achieve an innovative and informative Internet site. We hope that you will be as pleased as we are about this creative effort. However, you also need to understand that Rolls-Royce Power Systems AG must protect its intellectual property, including its patents, trademarks and copyrights. Accordingly, please appreciate that no license to Rolls-Royce Power Systems AG's intellectual property has been granted by this internet site.